Person #260 Child Wife Father Mother <Previous><Next> A, D, G, 5, 6, ? The gravestone for Richard's son, William, states his parents were R and N Wright. Since the names Nancy and Ann were often interchangeable (I believe Nancy would have been the nickname) I tend to believe that wife Ann, mentioned in Richard's will, was indeed the mother of William, if not of all his children. Some researchers state that he was married to Nancy Davis but, so far as I know, no real evidence exists. In 2009 I received a several-generation copy of Richard Wright's will, as recorded in the Rowan county clerk's office, from Michael Wright of Jackson County, Indiana. The mark, at left, is taken from that. A few months later, Shirley Gragg sent a copy she received from the North Carolina State Archives. It is this document--most likely the original entry--that Sandra Stanton refers to: "When the [Rowan] county clerk had entered the will in the county records she or he left out two lines. The original will was finally uncovered at the NC Archives by a Wright researcher from here in San Diego. Of course the son [Evans] that had been missed just happened to be [our] ancestor." I think we can be reasonably certain as to how the notion of Richard Wright "middle initial" erroneously came about. It's too bad that so many "genealogists" are so careless in their interpretation of documents.. The following trascription was lifted from Herbert Arkin's website. It's in sore need of revision. From the office of Clerk Superior Court, Rowan County, Salisbury, North Carolina, in Will Book C, page 207. 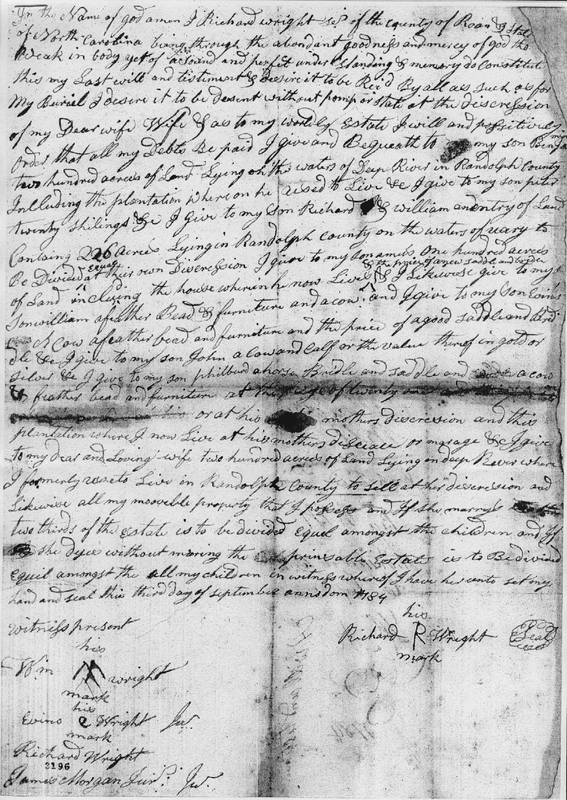 The will was probated Feb 8, 1785 by Evans Wright and James Morgan Junr. His widow, Ann, and William Wright qualified giving bond of 200 pounds with James Morgan as security. Genetic genealogy has dispelled at least two Wright myths and have brought us much closer to the truth of Richard Wright's ancestry. DNA has disproved that he was a son of Daniel and Eleanor (Benton) Wright--a tidy and long-accepted connection that is simply not correct. Likewise, DNA has disproved that Richard was a descendant of William Wright, of the John Washington family. On the other hand, it has shown that Richard was closely related to Philbert Wright, baptized 1719 in Maryland, a son of Philbert Wright and Esther Becraft. More information about the genetic evidence can be found at Patrilineal Descendants of Philbert Wright. Following is a county history biography of Grant Wright, the transcription having been lifted from http://www.geocities.com/macase1961/Briogra2.htm#grantf. See also the article that Grant wrote about Richard's son, William Wright. GRANT F. WRIGHT, of Washington township, Washington County, Indiana, is of pioneer stock and is one of the excellent farmer of this section. He was born on July 3, 1868, on the farm where he now resides with his father, PHILBIRD MARION WRIGHT. Philbird Marion Wright was born in September 17, 1832, and is the youngest of three children born to ELI and ELIZABETH (BOWER) WRIGHT. Eli Wright was born on September 5, 1795, and was the son of PHILBIRD and MOLLY (SEARS) WRIGHT. Philbird Wright was born on March 29, 1768, and was the son of RICHARD WRIGHT, who came to America from England in the early days. He had five sons: WILLIAM, PHILBIRD, AMOS, RICHARD, JR., and HUGH. Amos had five sons also, who were all ministers and noted for their ability. Their names were JOHN, PETER, JOSHUA, LEVI and AMOS, JR. John Wright was one for the forters at Ft. Hill, and one of his children, ELVIRA, was born in the fort in 1813, and lived her entire life within sight of the fort. She had three brothers and one sister; DAVID, RANSOM, JACOB and NANCY. Jacob Wright preached the dedication sermon at Ft. Hill on October 1, 1860. Philbird Wright, son of Richard Wright, who was the first of his family to settle in America, married MOLLY SEARS and they located on the farm once owned by HARRY DENNY but now in the possession of HENRY ROBERTS. Molly (Sears) Wright was born on February 13, 1776. They were the parents of eleven children: NANCY, born on February 13, 1794; ELI, September 5, 1795; EVANS, July 18, 1797; SARAH, September 14, 1799; BARBARA, November, 1801; ELIZABETH, November, 1803; KATHERINE, January 5, 1805; DELILAH, born on February 10, 1809; JOHN, ABSALOM, CELIA (RATTS) and POLLY. The mother of these children died on September 10, 1830 and her husband married ELIZABETH BECK on November 15, 1832. Philbird Wright immigrated to Indiana from North Carolina about 1809. Eli Wright and his wife, Elizabeth (Bower) Wright were the parents of three children: ADAM H., who died in 1901; CAROLINE, wife of JAMES BREWER, who died in 1898, and PHILBIRD MARION. Eli Wright built and operated one of the first grist-mills in the township. He died of cholera on June 14, 1833, and his wife, in 1847. Philbird Marion Wright received his education in a log school house, located about two miles south of Salem, Indiana, and later became a school teacher. The school which he attended had a large fireplace and the seats were split logs. His first teacher was PROF. JAMES G. MAY. Philbird Marion married ELIZABETH WISEMAN in 1863 and they became the parents of two children, CORA, who died in 1903 and GRANT, who now resides with his father. The mother died in 1905. Philbird Marion Wright has lived on his present farm for more than sixty years. His wife was born on August 21, 1831, in Washington county, Indiana, and was the daughter of JACOB and POLLY (RATTS) WISEMAN. Her marriage was solemnized on May 28, 1863. Jacob Wiseman was a native of North Carolina and it was there that he was married to MARY MAGDALENE RATTS. He was a music teacher. They became the parents of these children; JAMES, HENRY, NEWTON, MARY, ELIZABETH, SARAH, AMANDA, MARGARET, MALINDA and several more who died in infancy. Grant Wright was reared on the farm where he now lives with his father, Philbird M. Wright, and was educated in the township schools. Also in the graded school at Salem, Indiana, and in May's academy. He is an active Democrat and a member of the Church of Christ at Ft. Hill Chapel. The farm which he cultivates consists of two hundred and sixty-seven acres, fifty acres of which are in timber. This farm is known as "Riverside Farm" and is situated in an excellent location. Cora, the sister of Grant Wright, who was born on September 22, 1872, and who died on July 2, 1903. During her lifetime she was recognized as a writer of attainment and contributed to many newspapers and magazines. She was a cultured writer and her death interrupted what promised to be a career in field of literature. ...they had a son Philbert bapt. 1719. R.W. Barnes' (1989) "Baltimore County Families 1659-1759" lists a Philburd Wright (no dates) who had sons Richard and Philbert, both of whom served in the Revolutionary War and moved to NC. Philbert moved to Orange Co., NC2 and Richard d. ca. 1786 in Rowan Co. NC. Barnes, or one of his research associates, misinterpreted the information from their source, the 1970 reprint and revision of the 1949 "Revolutionary Soldiers Buried in Indiana" by Margaret R Waters. After studying the entry, I see that the misreading is understandable. Frankly, the article is a mess. But a careful parsing of the following paragraph reveals that the father of Philburt Wright Sr and Richard Wright Sr is actually not mentioned. Philburd Wright, Junior, was the son of Philburd Wright, Sr., who was b. in Baltimore Co., Md; went in 1762 to Orange Co,. N.C. (part later called Randolph Co.) with his (Sr.'s) bro., Richard Wright, Sr. (Richard Wright, Sr., also born Baltimore Co., Md; d. 1786, Rowan Co., N.C.; had a son Philburt Wright, b. 1768, who mov. to Cumberland Co., Ky.; then to Washington Co., Ind., where he made affid. for pens. appl. 1832 of his bro., William Wright, "Roster" p.391). Philburd Wright. Jr.'s chn. : Joshua (disappeared 1815, New Orleans); Caroline Delilah m. John Summey; Sarah m. John Fontz; Mary m. John Beard; Noah b 8-30-1784, Randolph Co., N.C.; d. 7-11-1863, Perry Twp., Marion Co., Ind. ; Susannah Parr, d. 10-9-1842 (dau. of Arthur & Mary Morgan Parr, natives of Rowan Co., N.C.); Levi b. 6-12-1790, N.C.; d. near Salem, Washington Co.,Ind. ; m. Sarah Wright, b. 8-31-1797, d. 8-19-1834 (cousin; dau. of William & Elizabeth (Morgan) Wright; William a Rev. sold. ; "Roster" p.391); Joel b. 2-5-1795, Randolph Co., N.C. (or born 2-5-1793, Stokes Co., N,C. ); d. 4-9-1828; m. 9-10-1812, N.C., Sarah Birely, b. 4-30-1789, d. ae. 76; Jesse m. Mary Brown; Elizabeth m. James Rains; Aaron m. Ruhama Sellers; Eli (liv. Wayne Co., Ind., 1893; mar., & a son). Noah Wright to Jeffersonville, Ind., 1808; back to N.C. a yr.; to Washington Co., Ind., 1810; in 1831 to Marion Co., Ind., & sett. in Perry Twp. Levi Wright to Ind. 1810 & sett. near Salem, Ind. Joel Wright to Ind. Terr. 1813 with parents; in Nov. 1815, Joel sett. on W. fork of Whitewater in (now) Wayne Co., Ind. ; to Washington Twp., Marion Co., Ind, Dec. 1821. REF: "Ind. Mag. of Hist. ", v.36, pp.160-161: Pict. & Biog. Mem. of Indpls. & Marion Co." (1893) pp. 243-244; Sulgrove--"Hist. of Indpls. & Marion Co., Ind." (1884), p. 628. Margaret Waters was good enough to cite her sources. Unfortunately, each of them is secondary. J. Campbell says on GenCircles that a "Philbert Wright transported to Va./Maryland in 1663." No source noted. I found this entry from Filby's Passenger and Immigration Lists. In turn, Filby cites Nugent's "Cavaliers and Pioneers," Vol 1, page 512. WALTER GRAINGER, 2000, acs. in the freshes of Rappa. Riv., beg. on S. side of the River about 4 mi. above Nanzimum Towne &c. 26 Sept. 1663, p. 365, (396). Granted to Mr. Thomas Purefoy 13 Mar. 1655, by him assigned to Tho. & Robt. Elliot, sons of Anth. Ellyott & renewed in their names 25 Nov. 1658, by them deserted & granted sd. Grainger by order of court dated herewith & due for trans. of 40 pers: 20 negroes; James Trew, Jno. Jordan, Phil. Wright, Roger Pillips, Jervis Salmon, Fra. Plowman, Fra. Fisher, Wm. Mead, Emil. Umpton, Sarah Waite, Tho. Carier, John Card, Step. Rogers, Charles Smart, Jno. Sims, John Mahew, Rich. Hollis, Eliz. Tatler, Tho. Jones, Jno. Taylor. I have no opinion as to whether "Phil. Wright" can or should be read Philbert Wright instead of Phillip Wright. But, until we have a better idea, it's only worth noting. Regardless, if there really was a Philbert Wright who arrived in 1663, he'd have probably been too old to have been Richard Wright's father. Could he have been his grandfather? If so, we'd have something like this. Both the genetic and genealogical record indicate that Richard was Philbert's son. To my knowledge, primary source material doesn't exist showing that the Philbert Wright of Orange county, NC and Richard Wright were even brothers. However, the name Philbert as a forename is rare. It wouldn't surprise me if it existed only among this particular family of Wrights. But there is some hope to the extent that it's possible to determine through genetics whether Philbert Sr and Richard Sr were brothers. As per the Waters extract, above, Philbert (married Elizabeth Reagan) had the following sons: Joshua, Noah, Levi, Joel, Jesse and Aaron. Certainly, there are still some Y chromosomal representatives alive today. Any potential candidate should contact the Wright Surname DNA Project. See Patrilineal Descendants of Philbert Wright for more information. 1. Pennsylvania Archives, Second Series, Published under the direction of Matthew S Quay, Secretary of the Commonwealth. Edited by John B Linn and Wm H Egle, MD., Vol VIII. Harrisburg, 1878. 2. According to "Some Neglected History of North Carolina" by William Edwards Fitch (1905), a Philbert Wright of Orange county, NC signed the 9th Regulator advertisement in 1768. Fitch's source was "Colonial Records of the State of North Carolina, Vol VII, pp. 733-737." 3. Ann's father, William Allen Magee IV, is the source of much of the information she has--all of it found in a Wright family bible, once in the possession of the Baird Family of Norfolk and Richmond, VA.
4. A May 2008 email from Robert Grant points out that this William Wright (born 1809) was not of the John Washington/Francisw Wright line line: 1792 John Wright of Fauquier County, Virginia, was not the son of 1729/30 John Wright of Stafford County, Virginia, or the grandson of 1713 Francis Wright of Westmoreland County, Virginia. We found one documented descendant of 1713 Francis Wright through his second son 1741 Richard Wright of Westmoreland County and one partially documented descendant of 1655 Francis Wright of Yorkshire County, England, the grandfather of 1713 Francis Wright. Their haplogroup is J2, which is different from 1792 John Wright's haplogroup of R1b1b2. This is set out at the Wright DNA Project with listings under 1792 John and 1540 John for the two lines.